With the first detailed observations of a lava lake on a moon of Jupiter, the Large Binocular Telescope Observatory in Arizona places itself as the forerunner of the next generation of Extremely Large Telescopes. The applied high-resolution imaging methods were developed by an international research team including scientists from the Max Planck Institute for Radio Astronomy in Bonn and the Max Planck Institute for Astronomy in Heidelberg. 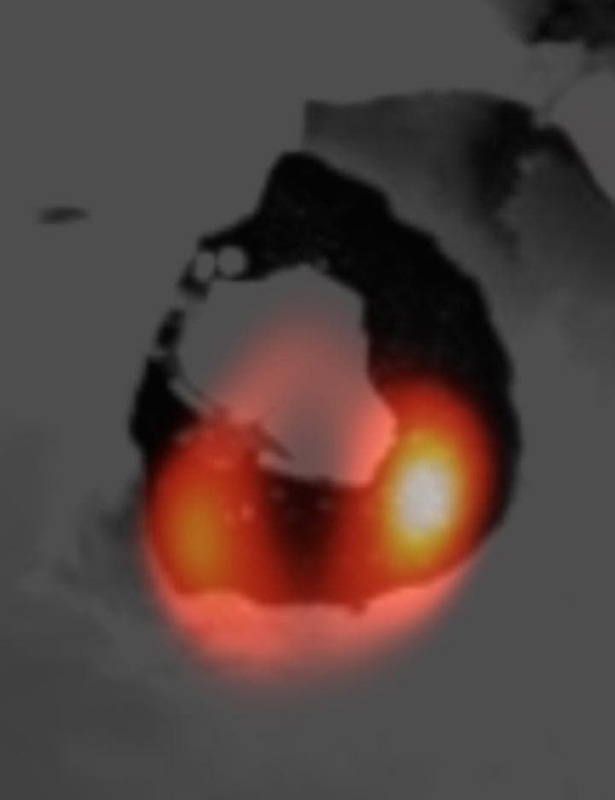 The LBT image above of the lava lake of the volcano Loki on Jupiter's moon Io (orange) was laid over a Voyager image of the same structure (dark shade), as captured by space probe Voyager 1 (dark shading). Io, the innermost of the four moons of Jupiter discovered by Galileo in January 1610, is only slightly bigger than our own Moon but is the most geologically active body in our solar system. Hundreds of volcanic areas dot its surface, which is mostly covered with sulfur and sulfur dioxide. The largest of these volcanic features, named Loki after the Norse god often associated with fire and chaos, is a volcanic depression called patera in which the denser lava crust solidifying on top of a lava lake episodically sinks in the lake, yielding a raise in the thermal emission which has been regularly observed from Earth. Loki, only 200km in diameter and at least 600 million km from Earth, was, up to recently, too small to be looked at in details from any ground based optical/infrared telescope. With its two 8.4 m mirrors set on the same mount 6 m apart, the Large Binocular Telescope (LBT) has been designed to ultimately provide images with the level of details a 22.8 m telescope would, by combining the light through interferometry. Thanks to the Large Binocular Telescope Interferometer (LBTI), an international team of researchers was able to look at Loki Patera in details for the first time from Earth in a study published today in the Astronomical Journal. The interferometric image below of Jupiter's moon Io taken with the LBT on Dec. 24, 2013 (left) compared to a satellite image on the basis of images from NASA space missions like Voyager 1 and 2 or Galileo (right). The lava lake of the Loki volcano can be seen in dark red on the LBT image. 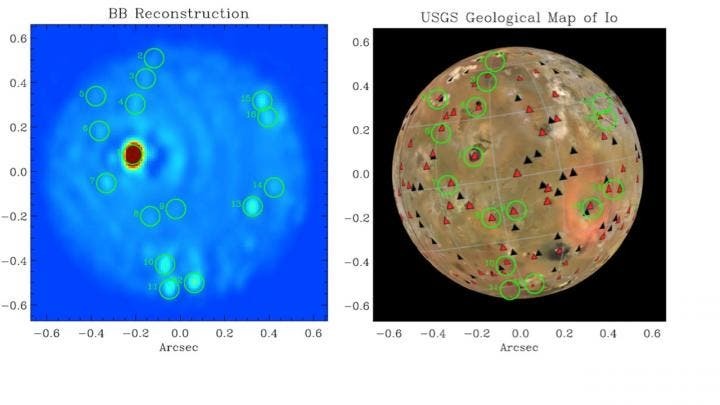 The circles mark the positions of further volcanoes on Io. "We combine the light from two very large mirrors coherently so that they become a single, extremely large mirror," says Al Conrad, the lead of the study and a Scientist at the Large Binocular Telescope Observatory (LBTO). "In this way, for the first time we can measure the brightness coming from different regions within the lake." "While we have seen bright emissions – always one unresolved spot – "pop-up" at different locations in Loki Patera over the years", explains Imke de Pater, a Professor at the University of California in Berkeley, "these exquisite images from the LBTI show for the first time in ground based images that emissions arise simultaneously from different sites in Loki Patera. This strongly suggests that the horseshoe-shaped feature is most likely an active overturning lava lake, as hypothesized in the past." "Two of the volcanic features are at newly-active locations", explains Katherine de Kleer, a graduate student at the University of California at Berkeley. "They are located in a region called the Colchis Regio, where an enormous eruption took place just a few months earlier, and may represent the aftermath of that eruption. The high resolution of the LBTI allows us to resolve the residual activity in this region into specific active sites, which could be lava flows or nearby eruptions." "Studying the very dynamic volcanic activity on Io, which is constantly reshaping the moon's surface, provides clues to the interior structure and plumbing of this moon," remarked team member Chick Woodward of the University of Minnesota. "It helps to pave the way for future NASA missions such as the Io Observer. Io's highly elliptical orbit close to Jupiter is constantly tidally stressing the moon, like the squeezing of a ripe orange, where the juice can escape through cracks in the peel." Io produces about 100 times more lava each year than all the volcanoes on Earth. While Earth's volcanoes occur in localized hotspots like the "Ring of Fire" around the Pacific Ocean, Io's volcanoes are distributed all over its surface. A global magma ocean about 30 to 50 kilometers (20 to 30 miles) beneath Io's crust helps explain the moon's activity. "It has been suggested that both the Earth and its moon may have had similar magma oceans billions of years ago at the time of their formation, but they have long since cooled," said Torrence Johnson, a former Galileo project scientist based at NASA's Jet Propulsion Laboratory in Pasadena, Calif. He was not directly involved in the study. "Io's volcanism informs us how volcanoes work and provides a window in time to styles of volcanic activity that may have occurred on the Earth and moon during their earliest history." Galileo was launched in 1989 and began orbiting Jupiter in 1995. Unexplained signatures appeared in magnetic field data from Galileo flybys of Io in October 1999 and February 2000. After a successful mission, the spacecraft was intentionally sent into Jupiter's atmosphere in 2003. With plumes of matter rising up to 186 miles (300 km) above the surface, Io is considered a prime candidate as a hotspot for extreme extraterrestrial life. In the image of Io, above, the lighter spot at the top right (north) of the planet, is an eruptive volcano. "Life on the surface is all but impossible, but if you go down further into the rocks, it could be intriguing," he said. "We shouldn't categorize it as dead right away just because it's so extreme." 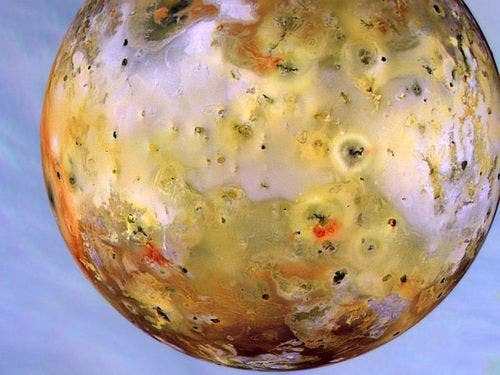 Computer models suggest Io formed in a region around Jupiter where water ice was plentiful. Io's heat, combined with the resulting possibility of liquid water, could have made life plausible. “There must have been quite a lot of water on Io shortly after formation, judging from the amount of water ice on Europa and Ganymede,” said Schulze-Makuch. The primordial soup that any life on Io might have originated from was likely based on water, but the solvent of choice for organisms there might have drastically changed later on as the moon transformed. Hydrogen sulfide is one choice, as it is reasonably abundant in Io's shallow subsurface and remains liquid from negative 123 to negative 76 degrees F (-86 to -60 degrees C), falling within the environmental conditions that would prevail there. While it is not especially efficient as a solvent for ions, it does dissolve many substances, including many organic compounds. Other possibilities include sulfur dioxide and sulfuric acid. "I'm exploring with colleagues whether sulfur compounds could work as solvents of life," Schulze-Makuch noted. Given the wild extremes Io can swing through as it orbits Jupiter, one possible survival strategy for life in this challenging environment would be to remain dormant most of the time, only reverting back when nutrients were rich. "It'd be much easier for life to take a beating if it goes dormant regularly," Schulze-Makuch said. Dark Matter –"Is a Parallel Universe That Could Harbor Rich Physics and Complex Behavior"